This SOLO R7N-J8000 7-oz. wax-coated paper cup with Symphony print measures 2.8 x 3.7 inches (Dia x H) and is suitable for serving cold foods and beverages. (Dia is diameter, the horizontal distance from one side to the other; H is height, the vertical distance from bottom to top.) The cup is coated with wet wax for rigidity and protection from leaking. It meets ASTM International standard D6868 for compostability. 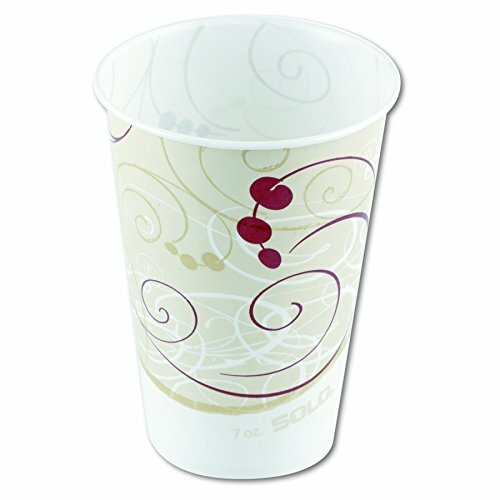 This wax-coated paper cup with Symphony print is suitable for serving cold foods and beverages in a variety of settings.